Four people were rescued from the collapsed building in Oke Arin, Lagos Island. 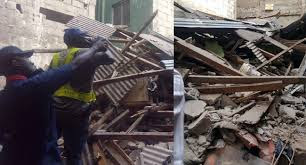 The building located at No 57, Egerton Square, Oke Arin, reportedly collapsed during the demolition of another building by officials of the Lagos State Building Control Agency. The four were rescued by firefighters at the scene and they have been taken to the hospital. The Director of the Lagos State Fire Service, Rasaki Musbau said: “Our men at the site of the collapsed building reported that it was a partial collapse. And they have been able to evacuate four persons alive from the rubble. The victims have also been taken to the hospital for treatment."